Good news for people who want their phones to stand out in the crowd. No matter what brand’s smartphone you use, what kind of smartphone you prefer but this will surely make you think a little. Oppo is know for its innovative ideas which they implement on their smartphones and Oppo N1 Mini is also such a smartphone. It is actually a smaller version of the Oppo N1, which is bigger in size and the main feature of Oppo N1 Mini is its rotating camera, which is same as the N1. Today, Oppo posted a teaser on it social networking profiles with an image of the phone and sources have confirmed that the phone is going to be launched in India this month. The phone sports a 5-inch(720x1280p) display. It is powered by a 1.6GHz Qualcomm Snapdragon 400 quad-core processor and 2GB RAM. It sports a 13MP rotating camera lens with an LED flash. The camera is capable of taking 24MP pictures through the Ultra HD mode. The phone comes with 16GB internal storage but doesn’t feature a microSD card slot for expansion. It has a 2140mAh battery. 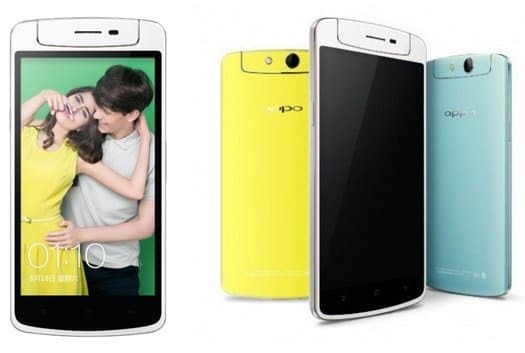 The phone runs Oppo’s Color OS 1.4 based on Android Jelly Bean. In terms of connectivity, the phone supports 4G LTE, 3G, Bluetooth and Wi-Fi. This is what Oppo posted on Twitter. Oppo launched the N1 Mini in China, last June at a price tag of 2699 yuan or Rs 26,600 approximately. Know more about its ancestor the Oppo N1 in our previous post.